I love reading cookbooks, even if I don’t make any recipes from them, I like looking at the pictures, reading the descriptions, and imagining the possibilities. This is my latest favourite, even though I haven’t made anything from it yet. It’s a gorgeous book, the recipes sound amazing (and don’t appear to be too difficult), and it’s a beautiful tribute to his family, and of course, who doesn’t love Stanley Tucci! Not sure I’ll have time this weekend to attempt any recipes from the book, but I’ll post pictures when I do. 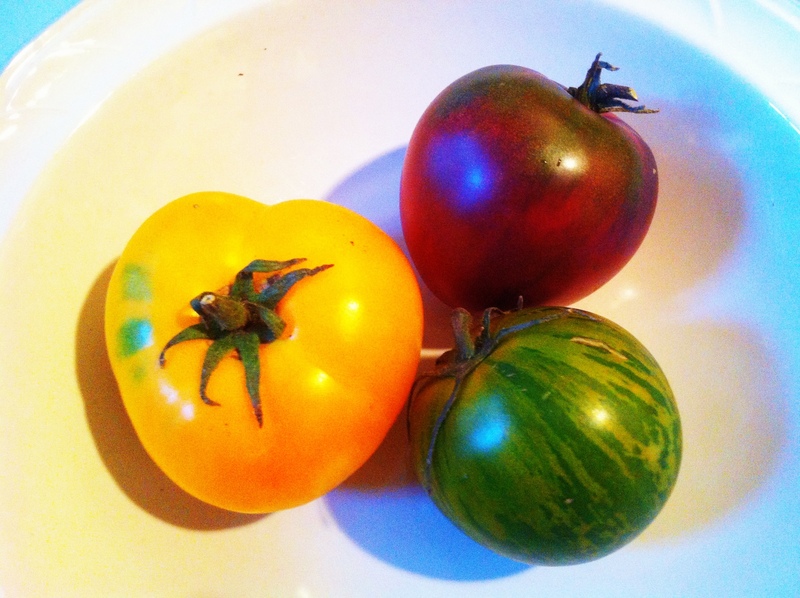 A friend who is an amazing gardener gave me these tomatoes. He and has wife have a massive garden on their balcony, plus two community garden plots. 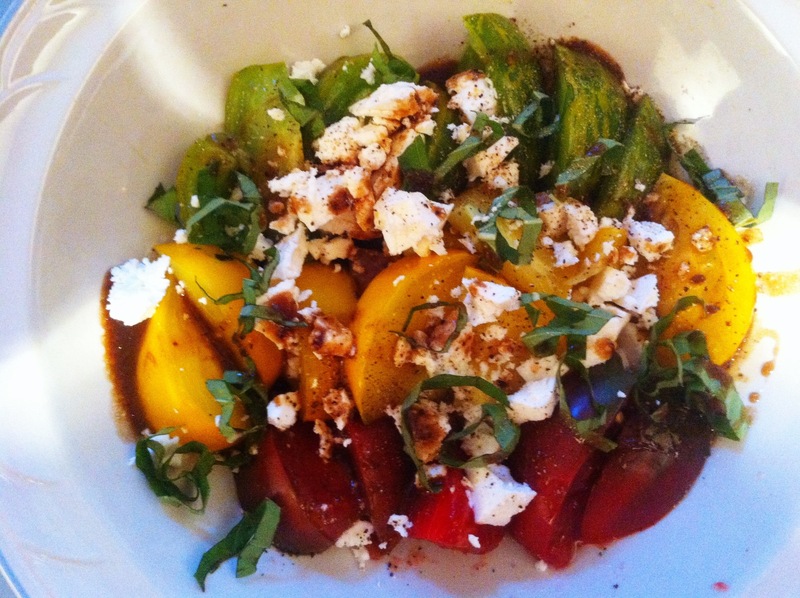 He told me the names of the tomatoes but I don’t remember… I just know they tasted amazing! I made a simple salad – sliced tomatoes, fresh basil, feta (bought some “fancy” feta called Macedonian if I remember correctly – I made this a few weeks ago), balsamic dressing, and a bit of salt and pepper. It was fresh and so flavorful! I don’t profess to be an expert in the kitchen. I like to cook, I like to experiment, and I like to “jazz” things up. Sometimes my experiments are tasty, sometimes they are not. I’ve been a Type 1 diabetic for nine years (aka juvenile diabetes or insulin-dependent diabetes) and have to account for everything I eat with the appropriate amount of insulin, so I try to eat healthy the majority of the time. (But I have figured out how to have the junk food I like too!) 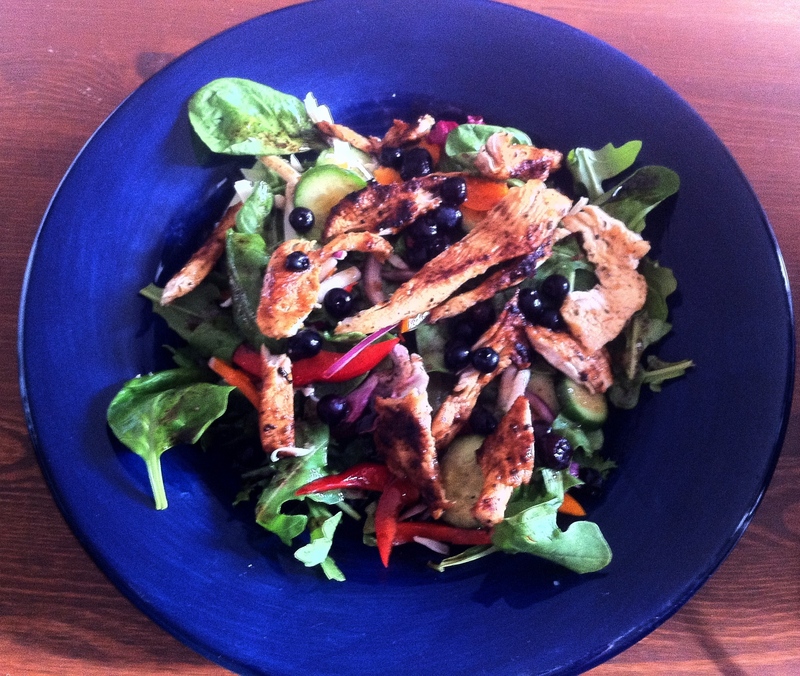 This is one of my more health conscious concoctions. -Cook and then cool pasta/noodles of your choice (I used Catelli Smart spaghettini because it has added fibre) I normally don’t rinse pasta for a hot dish, but I did for the salad and then tossed with a bit of olive oil. Put in the fridge to cool. -Cook chicken breasts. Whatever method you like – I baked them in the oven after marinating in sweet thai chili sauce. (I cooked three breasts at 425 degrees for about half an hour – a meat thermometer is my favourite kitchen utensil. There will be enough chicken leftover to make chicken salad sandwiches tomorrow). When the chicken was cool enough, I shredded it by hand and put in the fridge to cool further. *I did these two steps this morning before it got too hot outside. I have air conditioning, but my kitchen still gets really hot. I mixed up the dressing mid-afternoon, while watching a dumb movie (A Perfect Getaway) to escape the heat – it was plus 44 with the humidex (that’s about 111 degrees fahrenheit) this afternoon. *Whisk together and then add more of whatever you think the dressing needs. (I actually started with a different version by adding soy sauce, but it tasted weird, so I threw out that batch). I finely sliced cucumber, red and yellow peppers, mushrooms, and carrots. Toss chicken, veggies, pasta and dressing together. Let it sit in the fridge for a couple of hours if you have the time because the chicken will absorb a lot of the dressing and be moist and flavourful. If you don’t have the time, it will still taste good. I didn’t plan to post anything today. My plan was to be at the Roughriders pre-season game enjoying this beautiful evening, but I woke up at 6am with a terrible headache that has managed to last all day. I toughed it out at work just in case I felt well enough to go the game (I still follow the rule that if you’re sick and miss school or work, that means you also have to cancel whatever other plans you had – maybe that’s old school). Plus I couldn’t miss work because I had to do a job interview to hire a new person in my unit and oh yeah, because of the contract dispute at the library, if we call in sick, we have to have a doctor’s note (and the thought of spending time at the walk-in clinic on a beautiful weekend is not appealing). So, when I got home from work I was feeling a bit bummed out about missing out on some Friday night fun. I made spaghetti with a quick tomato sauce (I didn’t even have a glass of wine, in case people who know me are wondering), had a nap, listened to a few Tragically Hip and Trixie Whitley songs (she’s great, look her up on iTunes) and I feel a bit more human now. 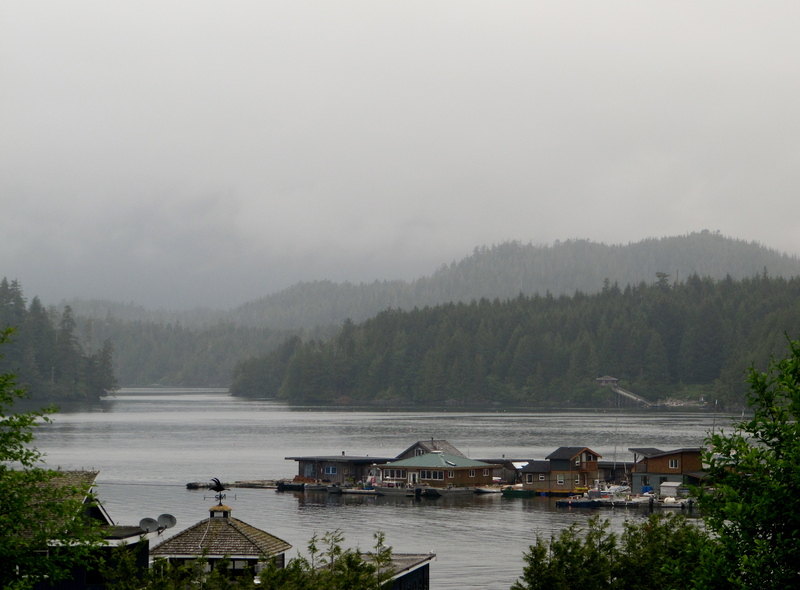 I’m sitting outside on my balcony, with a cup of tea, and my laptop, looking at pictures from a trip to Vancouver Island last June. It’s not all bad. These are my favourite pictures from that trip. 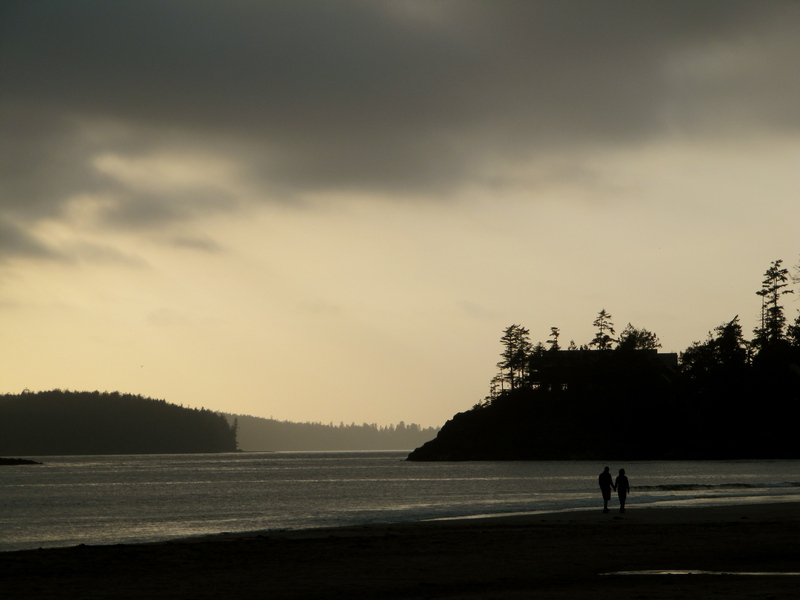 I love Vancouver Island, especially Pacific Rim National Park and the Tofino/Ucluelet area. It’s beautiful. I’ve been there twice in the last three years and hope to go again. I’m a prairie girl who is used to wide open spaces, so the old growth forests are astounding to me and I love being near the ocean. It’s a very mellow, laidback, peaceful place. I haven’t been there in July/August, the prime tourist season, so it might be different then. I’d highly recommend a trip there if you have the opportunity. This was my desktop picture on my computer at work for a very long time. 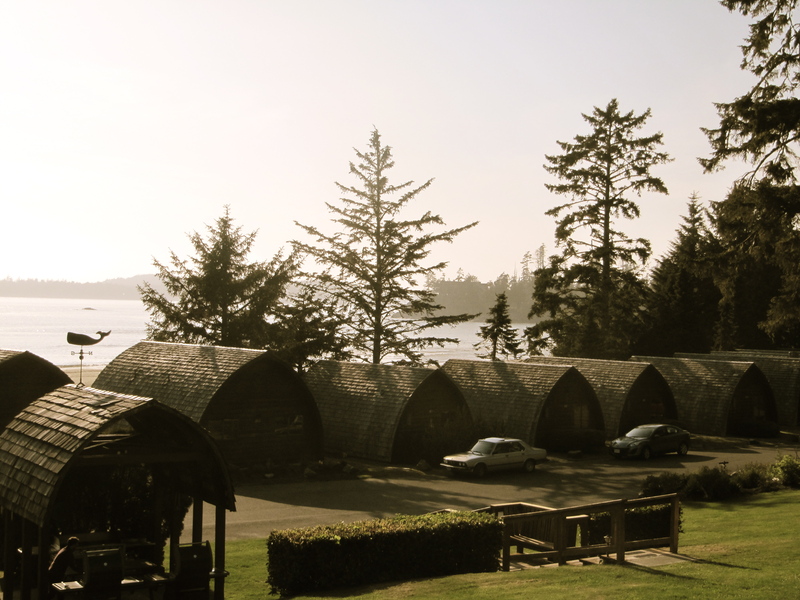 These are the cottages at Ocean Village Resort, just outside Tofino. I loved it there. The accommodations are rustic, but that’s part of the charm. And compared to the fancy resorts in the area, it’s a very affordable place to stay. 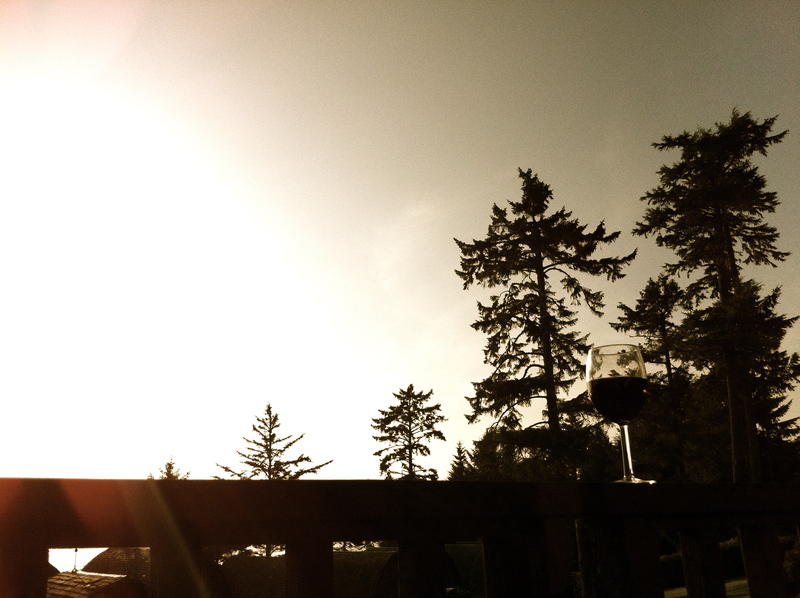 A glass of wine and staring out at the ocean. Within walking distance from Ocean Village is a cool little store that was stocked with so many tasty things for such a tiny space. 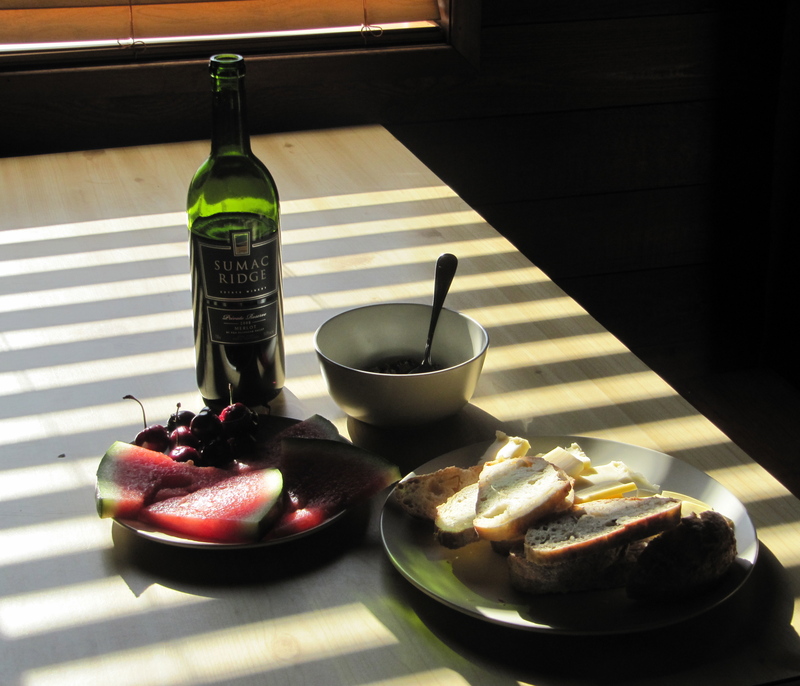 What more do you need for a feast than bread, cheese, fruit and wine? (The wine was bought on a wine tour in the Okanagan earlier in the trip). This was taken from the outskirts of Tofino. I think part of the reason I love Vancouver Island and the Pacific Coast so much is I grew up watching the Beachcombers on CBC so the scenery brings back childhood memories. I worked this weekend, so I’m off for the next two days. The forecast for today was rainy and cool so I decided I was going to bake bread. 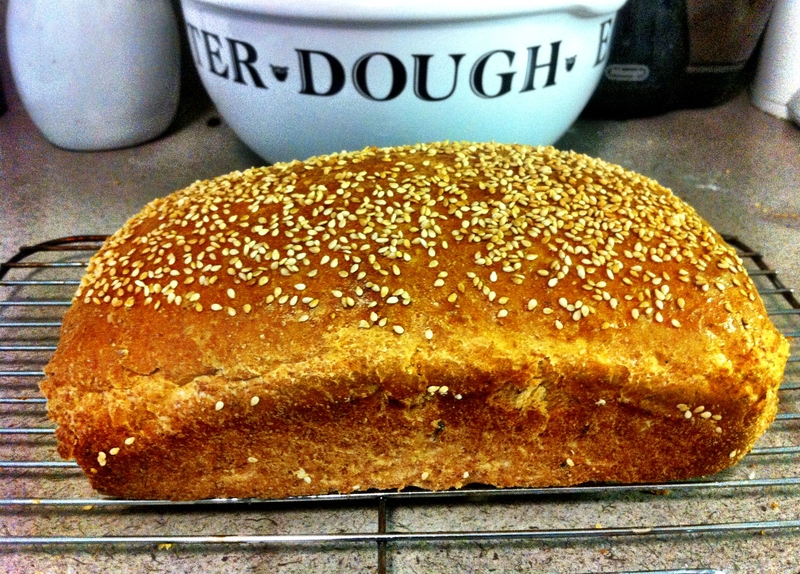 I love to cook, but I’m not a great baker, and I’ve never made a loaf of bread before from scratch. 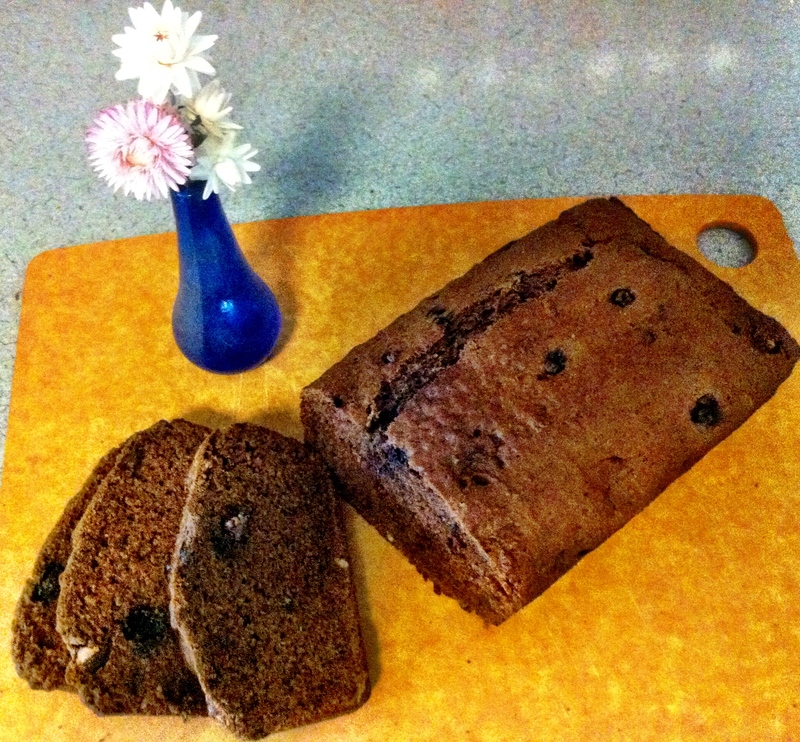 I used a basic whole wheat bread recipe from the Robin Hood flour website. It turned out pretty well for my first time, so now I feel encouraged to try other kinds of bread. All this baking took up most of the day so it was soon time to think about supper. I wanted something light to go with the bread so I marinated turkey breast strips in balsamic vinegar, olive oil, salt, pepper and lemon pepper for awhile (I’m not sure how long exactly, maybe half an hour), then made a balsamic vinaigrette with pretty much the same ingredients for the salad which was bitter greens, cucumber, peppers, red onion, grated old cheddar, and blueberries and then topped with the sauteed turkey breast strips. Delish. Now, I just need someone to clean up my kitchen!